The AANN CNRN Review course is used to assess whether or not a candidate is prepared for the Certified Neuroscience Registered Nurse (CNRN) examination. 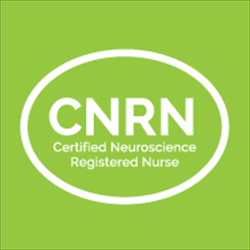 Use the CNRN Review course to better understand your current knowledge as it applies to the certification and determine where additional studies are needed. The review course includes a comprehensive instructor led video, interactive knowledge check, with correct and incorrect answer descriptions. Please note: The CNRN Review Course is not intended to replace studying for the credentialing of the examination. Your performance on the review course will not guarantee results on the actual CNRN examination. This one module review course includes a comprehensive video and interactive knowledge check. This course is not required to sit for the CNRN certification examination. Earn 1 CE Credit (after course and evaluation completion). Expiration: The CNRN Review Course is a 1 year subscription and will begin from the date launched on the Learning Management System (LMS). Note: Purchase of the CNRN Review Course is intended for single person use by the person who purchased the course. ONCE THE SELF-ASSESSMENT EXAMINATION IS PURCHASED, NO REFUNDS WILL BE ISSUED. To access this product on the LMS, please sign into the AANN Learning Portal.